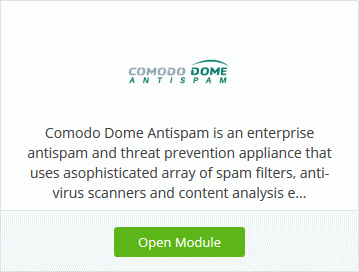 Comodo Dome Antispam lets MSPs to protect customer networks from spam and email-borne threats. This product is only available only to MSP customers. The basic version is free for thirty days and can be added to your account at any time. 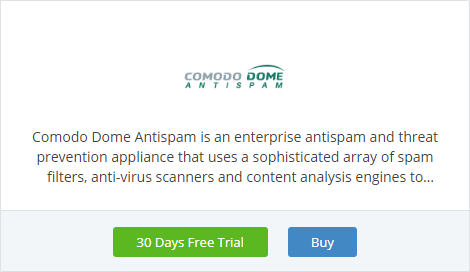 You can upgrade to the full product by purchasing a new license from the Comodo One console. 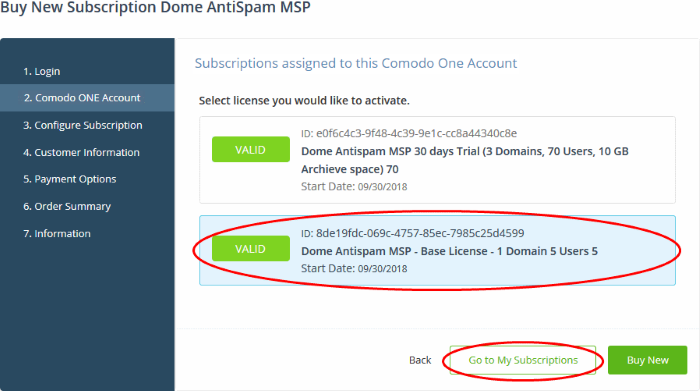 Alternatively, you can add Dome Antispam by linking another Comodo account that already has a license. Click 'Buy' or '30 Day Free Trial' depending on the version you require. Your login username is pre-populated and cannot be changed. 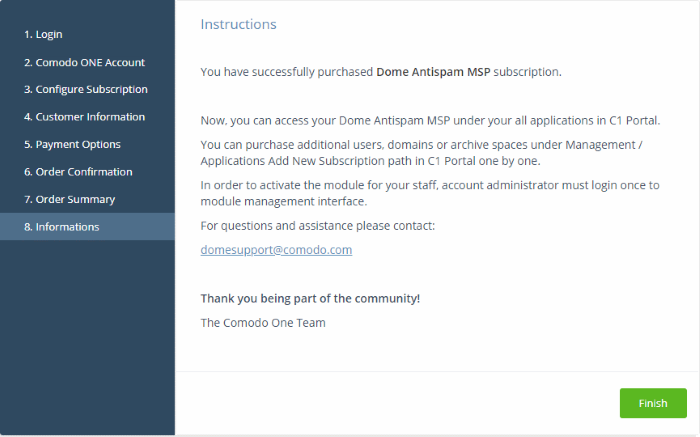 Paid version - Click the 'Buy New' button in the 'Comodo One Account' page then select a package. Click 'Next' to provide your customer information. Trial version – You will go straight to the customer information screen after login. 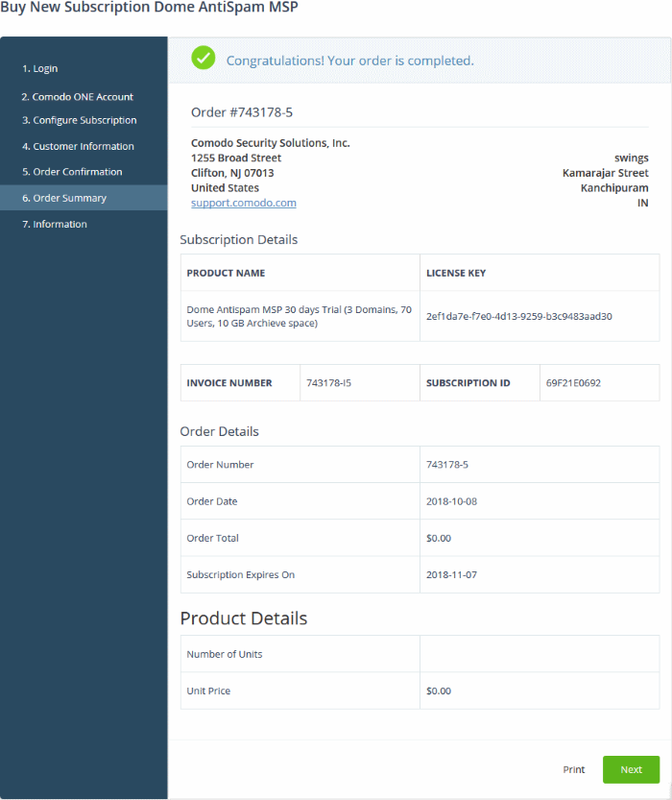 Paid version - You will be taken to the order confirmation and payment page. Review your order, enter your card details then click 'Next' to submit your order. Trial version - The order confirmation page will appear. Your order will be submitted. You will receive an order confirmation email which contains your license key. Click 'Print' to make a hard-copy of the order summary. Click 'Next' to view support details and instructions. 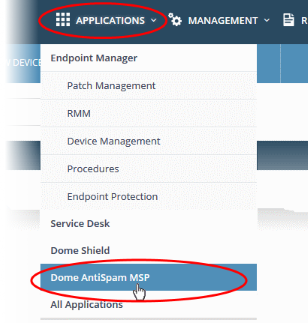 The information page explains how to setup Dome Antispam MSP. 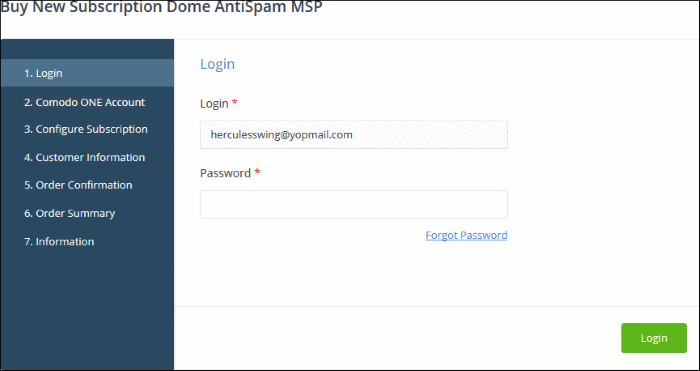 You will receive your antispam service URL via email after our support team sets up your portal. Click 'Licensed Applications' > 'Dome Antispam' to open the interface. See the description	at the end of this section if you need more help with this. On your first access, you need to enter the service URL we sent you over email. 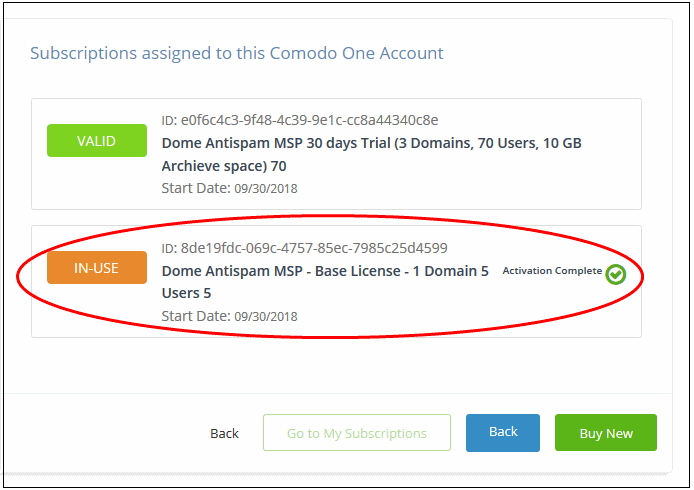 You can activate licenses for your Comodo One products through the 'Store' interface. 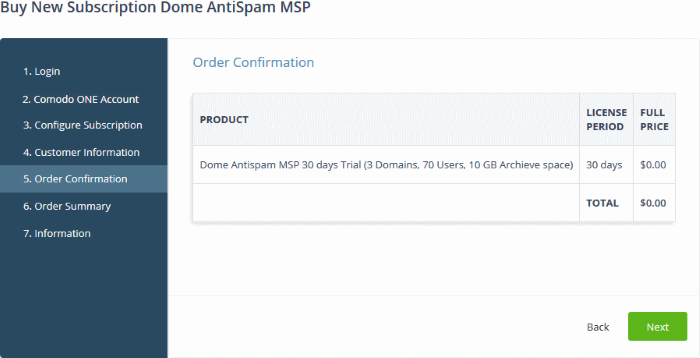 The license will be activated and 'Dome Antispam - MSP' will be added to your list of licensed applications. 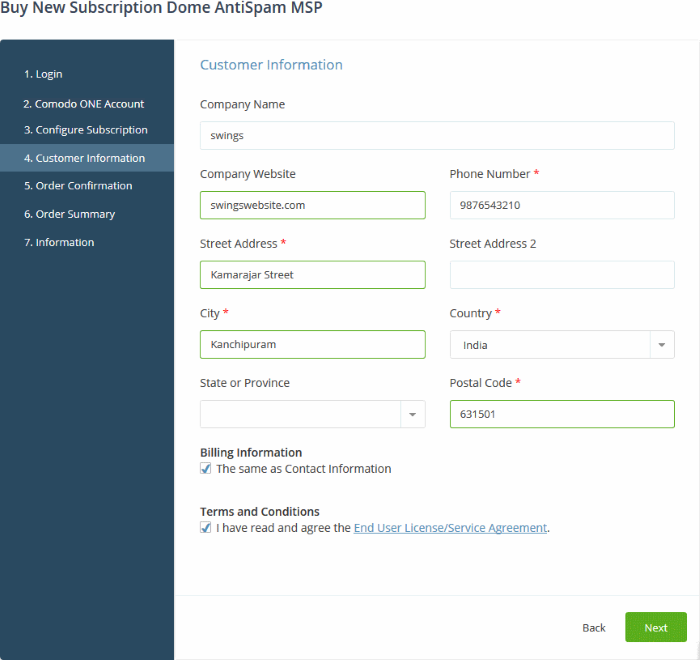 Click 'Go to My Subscriptions' to view the information about Dome Antispam – MSP.